Editor’s Note: Though a water heater is relatively inexpensive compared to the price of a house, repairs for the damage caused when one suddenly has a catastrophic failure is likely to be expensive. This is the reason many inspectors want to be able to give their clients some idea of how old the device is and when they need to begin considering replacement. How old is that water heater and what is the maximum service life an owner can expect? Your clients need to know the answers to these questions and others. Service life varies from place to place and is affected by the quality of the product, minerals/chemicals in water, the amount of maintenance the water heater receives and usage. In other words, there is no set maximum expected service life. In fact, two neighbors with exactly the same brand water heater installed on exactly the same day on the same street in identical houses can have completely different experiences. In some parts of the country it is normal to expect between 10 and 15 years, while in others a homeowner is lucky if the water heater lasts 10 years. The manufacturing date is coded into the serial number of water heaters and, since there are more than 100 different brands of water heaters in this country, trying to memorize every single serial number code at first seems impossible. Impossible until one realizes that until just a few years ago only six manufacturers produced those 100+ brands and some shared the same basic method for coding. This makes the task of memorizing the coding methods far less formidable. In this article I’ll explain the coding method used by each of the six major manufacturers. At the end of the article, there are links to a handy decoding chart at the website Inspectorsjournal.com. The chart helps to decode about 95 percent of the water heaters currently in homes in this country and it is periodically updated*. American Water Heater Company, manufacturer of 52 separate brands of water heaters, uses a 10-digit serial number with a year/week code in the first four digits of the serial number. The “year of” is the first two digits followed by the two digit week of the year. For example, the serial number 0602****** indicates that the water heater was manufactured the second week of 2006. A complete list of brands manufactured by American is contained in the decoder chart linked to this article. Until 2008, A.O. Smith Corporation manufactured only three brands of water heaters – A.O. Smith, Glascote and Perma-Glas, and used a 10-digit serial number with a letter-month/year code in the second third and fourth digits of the serial number. With this system, the letters A to M, excluding the letter I, are used to designate the months. The letter A for January, B for February etc., followed by the two digit year. For example,*H06****** indicates that the water heater was manufactured in August 2006. In 2008 A.O. Smith acquired State Industries, a manufacturer of about two dozen different water heater brands, and moved all manufacturing of residential water heaters under the A.O. Smith umbrella to the State facility. When looking at an A.O. Smith, Glascote or Perma-Glas water heater, if the decoding procedure above doesn’t work, the water heater might have been manufactured in the State facility after 2008, in which case one should try using the State Industries procedure outlined later in this article and refer to the State portion of the decoding chart. Bradford-White manufactures two brands of water heater- Bradford-White and Jetglas, and uses a 9-digit letter/number code with two letters signifying the year and month of manufacturer. The letters I, O, Q, R, U, and V are skipped to produce 20-year cycles. These cycles began in 1964 with the letter A, therefore the letter A in the first position of a B-W serial number can represent the years 1964, 1984 or 2004. B-W’s second letter corresponds to the month of the year as with the A.O. Smith example above. Prior to 1973, the month letter was placed at the end of the 9-digit serial number but from 1973 on it has been in the second position. For example, the serial number B********D indicates the water heater was manufactured in April of 1965 but the serial number BD******* can indicate that it was manufactured in April of 1985 or 2005. The trick is being able to distinguish the age of water heaters with the same date codes manufactured after 1973. Fortunately, most home inspectors can do this easily by checking the large yellow energy usage tag on the unit to see which ANSI date is posted there. There is one exception to B-W’s serial number code that was caused by a computer glitch when some units were manufactured with a serial number beginning with OA – O being one of the numbers that is not used. Any found with a serial number beginning with OA will have been manufactured in January of 1997. Lochinvar Corporation was acquired by A.O. Smith in July of 2011, so most Lochinvar numbers in the chart are accurate as of this writing. Lochinvar only manufactured four brands of water heater – Lochinvar, Energy Saver, Golden Knight and Knight, and used the identical dating code system used by Bradford-White Corporation. Rheem Corporation manufactures 20 different brands of water heaters and uses two different serial number series, one that is all numbers and the other which is both letters and numbers. However, the date code is based on the first four digits of the serial number, which signify the month followed by the year, the letter, which is in the fifth position, doesn’t need to be considered. For example, any Rheem manufactured product bearing the serial number 0794****** or 0794F***** will have been manufactured in July of 1994. State Industries was acquired by A.O. Smith in 2008. State manufactures 23 separate brands of water heaters, including the Kenmore (Sears) brand, and uses a letter-month/year serial number code similar to the A.O. Smith model with the letter signifying the month, followed by a number for the year. The difference is that the code is in the first three positions of the serial number, therefore a serial number C05******* indicates that the water heater was manufactured in March of 2005. There are other brands of water heaters being sold in this country that are not made by one of these six manufacturers; however, these 100+ brands comprise the overwhelming majority of residential water heaters that inspectors will encounter. Once one understands how these serial numbers work and learns to recognize each of the manufacturer’s patterns, it’s much easier to feel confident that one is providing the customer the correct information about the age of the appliance. 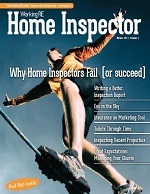 *This story is reprinted with permission from Inspectorsjournal.com. To download the most recent versions of the decoder chart, Click here. If you are not a forum member at The Inspectors Journal (TIJ), you’ll need to register. Registration is free, only takes a couple of minutes and TIJ doesn’t spam anyone or transfer members’ information to others.